Another week, another Cover of the Week! 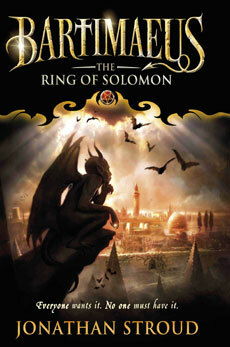 And this week it's the turn of Batimaeus: The Ring of Solomon by Jonathan Stroud! Published earlier this month, it serves as a prequel to the hugely successful Bartimaeus trilogy. I myself haven't read the trilogy, but I have this sitting on my reading pile and cannot wait to read it! But in the meantime, isn't that cover beautiful? In the flesh it's even cooler. The black bit at the top is glossy and the actually image has a matte finish which makes it even cooler! Happy Publication Day to Dark Matter! News: Michelle Paver wins Guardian Prize! Angel Blog Tour: L.A Weatherly's US Road Trip! Happy Publication Day to Angel!